Well you gotta start with the basics I guess. 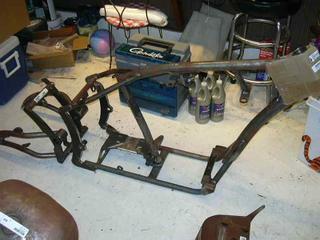 The frame is well, the framework for any motorcycle. 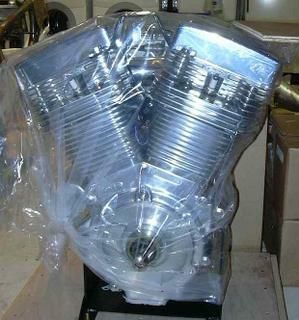 Mine is made by Big Bear Choppers in, yep, you guessed it Big Bear Lake California. As you can see in the picture the frame is raw metal. I am going to have it powder coated for the final assembly, but I havn't decided on a color yet. I am leaning towards a matte black and tan finish. But I won't know until the mock up is done and I can sit there and meditate on it. The motor is a Revtech 100 CI, or 1600 cc for you metric people. It should generate somewhere in the neighborhood of 110 horse power. I think that is more than my VW Beetles used to crank out. Shiny and pretty, this beast wants to hit the road. My plan tonight is to get everything unpacked and lay it out on the table. Take an inventory and watch the first part of the video to see what "step one" is. I don't wanna go to work I am so excited, geez. Can I have your driftboat for the winter? LOL, bootbobberin/bouncin starts this weekend. Regardless of motorcycle time.